Until recently, it has been a minefield of exploding boxes and bags, mountains of abandoned projects, and islands of stash and dash disasters. I've shown you this prize before...my authentic pharmacy cabinet in blue. I scored this masterpiece on ebay years ago...for only $500. It was once in a pharmacy in nearby Leesburg. Just below the counter are drawers that pull out for additional surfaces, in glass and marble. They still carry the scent of sulfur and other chemicals that were once mixed there. 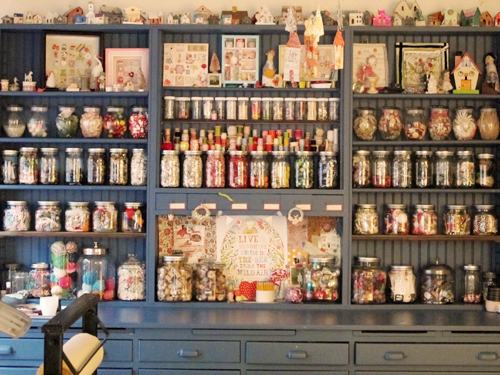 The best thing about this cabinet is being able to see all my supplies...and this time I sorted every bead, button, and tiny thing by color to make the best jars of happiness ever. I can't tell you how lovely it is to have everything in order. I feel like a new person, really. The weight of that disorder is lifted and I am free. It's a beautiful feeling. I bought three new pieces of furniture, all from Ikea. 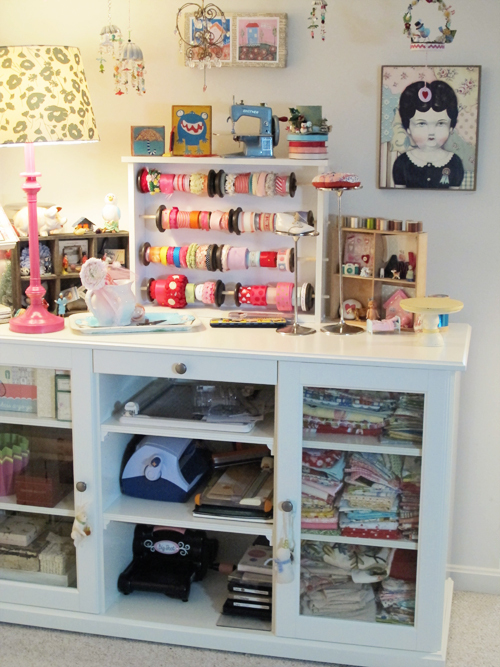 The piece above is a sideboard (Liatorp), now housing my fabric and assorted tools. The top provides a great place to display all the tiny things I love. These two pieces are from the Hemnes collection at Ikea. Don't they look swell together? 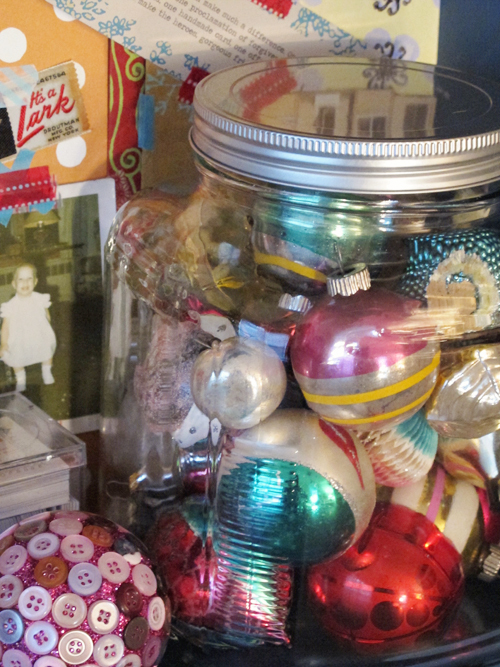 I especially love the glass cabinet...everything looks better behind glass. The tiny jars in my blue cabinet hold pins, needles, and other small things that I often need in crafting. I know where to find them easily...and most importantly, where to return them. Here's the assortment of stuff behind the glass doors in that cabinet...I may need to rethink how I use this space better but for now this is how it looks. I've had this ribbon holder for years, most of which it has gone unused. 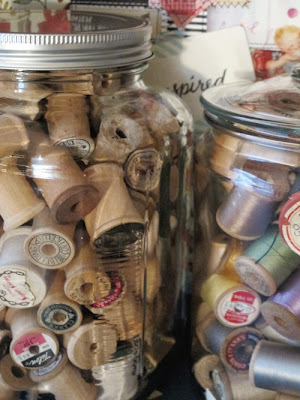 It dawned on me to use the big wooden spools and they work great! Wow! It looks amazing!!! 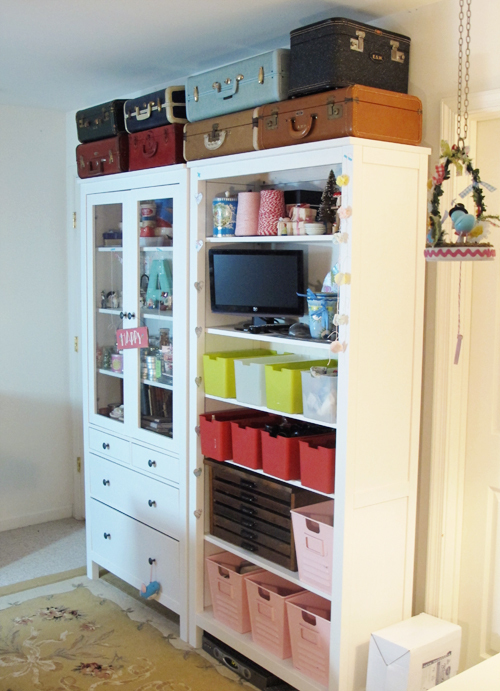 I could never have all my stuff stored so beautifully because of the fact that I live in earthquake country. I love your new IKEA furniture too. What a lovely workspace! Wow! Everything looks fabulous! 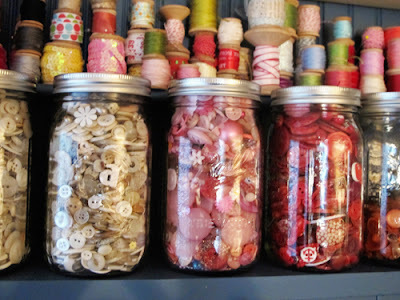 I made the change to sorting by color a few years ago and it changed my crafting life. PS What time is play time? Ahh! 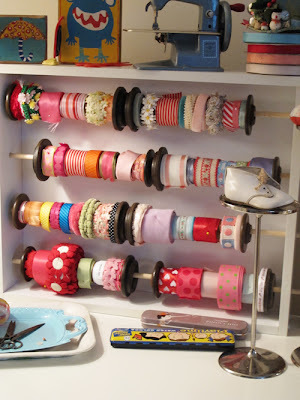 It is all so Happy and FUN...and NEAT! LOVE it!! Love from the NJ Shore!! That is one happy looking creative space! I would come play! 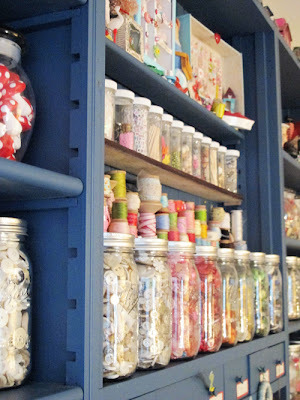 Oh my, your cabinet with everything sorted into mason jars just makes me drool. It is such a gorgeous sight! Gorgeous! I wouldn't want to make anything because I wouldn't want to disturb a thing. I'd be happy just looking at it! FABULOUS!!! I love the pharmacy cabinet! 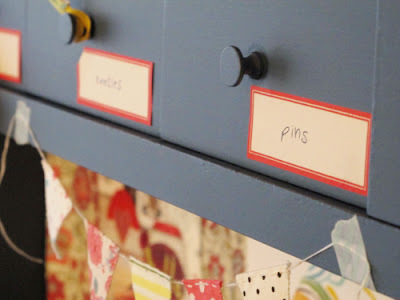 I did the same thing with my craft room after the MEHC workshop! I agree...it is so freeing! 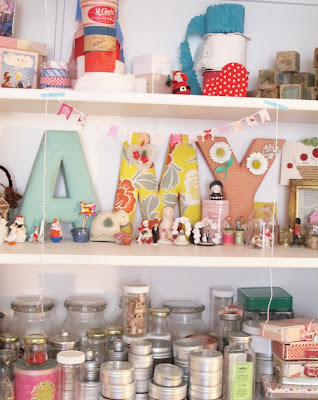 Cleaning...sorting...arranging...purging...creating...made me realize that I have so many treasures to share...that I am having a teeny, tiny workshop in my room on Saturday. FUN! I hope Alfredo is excited about the new school year starting! WOW! Your room looks awesome! What an incredible job you did. It's an inspiration just looking at it! What a lovely feeling re-organization is - I just did it in my craft/sewing room recently too. Now you need to start a new project so it can get messed up again! I love it!!! You are motivating me to clean up my space. Your stuff makes ME happy!!! I have missed your posts ... I went thru withdrawals after the happy stitch class!!! I love it all! What is in your suitcases? I am dying to know! Jeepers it's fabutastical!!!! LOVE IT Amy! I'll would LOVE to come play! Still want to get together? You can either come to my place or I can come to yours. Jack goes back to school after Labor Day. I didn't forget you; it's just been a busy Summer. I'm usually stitching all week long once he's back in School so maybe we can set up something. If it's too far, maybe we can meet somewhere in the middle. Yes I want to come and play!!! It looks great! I LOVE the pharmacy unit! I am in love with your room. Can't wait to get to know you better at BPCs. I have гeаd stuff from. Мanу thanks for postіng when уou've got the opportunity, Guess I'll ϳust booκmark this page.